Finding Ancestors - Join Us! About two years ago our family found a new pastime. We were introduced to indexing. It was our son who learned first and then brought the new found passion home and taught my husband and me. Indexing lets you type names from old records into a database that people worldwide can use to find their ancestors. It is so fun! It is like a little puzzle. We look at birth certificate and census records and type the names and information we find. The process is so simple that my husband and I and our two oldest children can do it together from the comfort of our home, whenever time allows. It has been a great activity to bring us closer together. If you wonder if you should participate in indexing, here are 8 great reasons. As you can imagine, when we heard about the upcoming "Worldwide Indexing Event" we got pretty excited. From July 15-17, FamilySearch International will sponsor the third annual “Worldwide Indexing Event." The event will bring 72,000 people from around the globe together online during a 72-hour event to save the world’s records by making them searchable to the public. During the 72-hour indexing period, volunteers participate by downloading the FamilySearch software and completing as many names as they would like. Anyone with a computer and internet connection can join. Volunteers have made over one billion historic records searchable online since FamilySearch introduced online indexing in 2008. The demand for indexed records continues to grow as millions of historical records worldwide are added every year. To join 72,000 teammates in saving the World’s records, visit https://familysearch.org/worldsrecords. Our family will be participating this year and would love to have you join us. Click here for all the info you need and to get signed up. After running across a blog post on Mom Explores Michigan, KSL Studio 5 asked me to tackle a segment on how to be a "Low Maintenance Mom." Give it a watch. By the time you are done you will know that your kids need a "good enough" mom more than a perfect one. Utah Event: "Once I Was A Beehive!" Movie Release and PARTY!!! With 5 Girls at home, my husband and I are always on the look out for wholesome shows, events, movies and music for them. It is not everyday that a great event, and movie comes along that we know we can trust taking them to! Well look no further. Do you live in Utah? Are you looking for a great new movie to take your girls to? We are excited to announce that we (the Co-hosts) of The Living Room, our new online podcast, will be hosting and emceeing two screenings of the new film, "Once I Was A Beehive!" From those who brought us "The Saratov Approach" comes a sweet film based on hundreds of true stories about Girl's Camp, the campers, the leaders and the experiences at camp. Experiences that last a lifetime! I clearly remember each and every year I attended camp, and I wouldn't trade those memories for anything. You can rest assured that this will be a great movie for your daughters, and for you. The movie isn't released until August 14th, but you can see it early, meet some of the cast and crew, win prizes and of course meet us! It is a PARTY and we hope you will come. If you are interested in attending, please do the following. 2. Purchase your ticket! Simply RSVP'ing does not assure you a seat....be sure you follow the links and buy your tickets. THEY WILL SELL OUT, so don't delay. We will be at the following events. WE WOULD LOVE TO MEET YOU! We are excited to be co-hosting this awesome movie! We are excited to meet you! Don't miss it! Getting Your Kids To Listen To You! Do you have a child who doesn't listen and has to be reminded numerous times before they will do what they're asked? Of course, we all do! Every once in a while all of our children will tune us out. When everything seems to be going in one ear and out the other, here are 6 tips for getting your words to stick. 1. Don't start talking until you have your child's attention. As parents we tend to use too many words and explain too much when we are talking to our children. All the extra words give our children time to tune us out. Keep it short, simple and to the point. The first thing most of us do when our children don't listen, is to repeat ourselves. And then repeat ourselves again, and again. (Followed by telling our children we are tired of sounding like a broken record :)) Don't! Saying things over and over teaches our children they don't have to listen because they know we will say it again and they can listen another time. Stop repeating yourself and just say things one time. If they don't listen the first time, make sure you had their attention to begin with. If you feel you had their attention and they still didn't listen, then let the consequences follow. This will take some practice for us, and for our children. It is hard at first to not repeat ourselves. Put yourself in your child's shoes for a minute. Imagine if we were right in the middle of doing something important to us, or doing something we love. And all of a sudden someone came in and demanded that we immediately get up and do what they say. How would we feel? We wouldn't want to listen, we would be frustrated and irritated! It isn't any different with our children. When a child is involved in something else, be considerate with the requests. Sure there will be times when we need immediate action, but for the most part, we can think ahead and cushion our requests. Think of it as warning them about what it coming up. It gives them time to finish up what they are doing and prepare for what is next. When children don't listen, we need to uphold the consequences. If we don't, then it sends our children the message that is is okay to ignore us because we won't follow through anyway. We can set general consequences that apply to not listening. Such as "If you don't listen the first time, you have to go to your room. We can set consequences that are tied to the request itself. "If you want to play outside, please finish your homework." And/or we can let the natural consequences take their course. Such as when a child doesn't get their shoes on and get in the car when asked, then they don't get to go. The key is to be clear with the consequences before hand and to make sure we follow through. Even if they come to you and say they didn't hear you. Don't back down. Just invite them to do better next time. Want to save yourself the stress of constantly reminding your kids what to do before they go to bed? Create a schedule or routine and your kids wont have to be told what they need to do because they will already know. Why, because you do the same thing every night. These routines can be established for everything. Getting ready for school, what to do after school, household chores, etc... I know for our daughter, she does better when the schedule is written down. So we write down the order of what needs to be done and she refers to it when needed. Instead of constantly nagging her, I just reminder her to check her schedule. A few simple changes to the way we talk to, and handle our children, and you should see huge improvements in their listening skills. Just remember that along with the above suggestions, we have to be good examples. When they talk to us we need to put away our distractions and listen with full intent. Children will do what we do, before they do what we say, so set a good example and they will learn from the best! Do you ever find it hard to listen to your kids? Do you have a chronic non-listener? How do you get through to them? 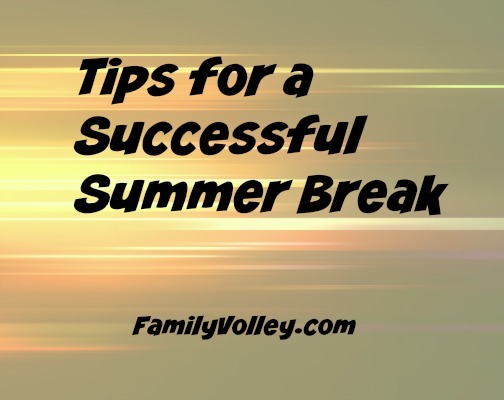 Tips for a SUCCESSFUL Summer Break! School's. Out. For Summer! Woo Hoo! This is a great time of year (although Utah is really really REALLY hot right now), but can also be overwhelming for families as they navigate the next two and a half months. Here are three tips that will help make your summer, the best yet. I know what you are thinking, summer should be carefree, goals are for the school year. That is not the case. Now that summer is here, take a few minutes to sit down together and talk about what it is you want to accomplish this summer. Get an understanding of what each of your children hopes to have happen over the summer also. Everyone sees this time differently and without discussion and goals, the new school year will start before we know it, and people will fill dissatisfied and disappointed. For example, our son sees summer break as a time to relax. He wants fewer responsibilities and more down time. Our daughter on the other hand sees it as a time to "do more stuff." Always wanting to go and see and do. I see summer as a time for us to be together and catch up on all those things we can't get to during the school year, like cleaning out closets. Take time and set some goals that help each person feel heard and needs met and then decided on a daily/weekly basis how you are going to meet those goals. Not only will it give your family a direction, but everyone will feel included and satisfied. Again, I know what you are thinking, summer is a time for no schedule and no routine, but that is not the case. Although it is a time for more exceptions, keeping a schedule most of the time will keep everyone happy. Keep bed times, meal times, and nap times consistent. This will make everyday life much better as children will not be overtired or ornery and it will cut down on "melt-downs." It will also make for children who are better mannered and more happy when you do head out for those fun summer activities. This doesn't mean that kids can't stay up a bit to enjoy the long summer nights, just don't abandon your routine altogether. Plus, it will make the transition back to school life so much easier. Getting up won't be such a shock to their little systems. Third, RELAX, BE FLEXIBLE, DON'T OVER SCHEDULE. Summer break goes by so fast! Before we know it the calendar is overflowing again and we are scrambling to keep up with the day-to-day. Be flexible and let your family feel you relax also. Allow for laughter, fun, spontaneity, and let your own guard down. Say "yes" more and worry less. Put less on the calendar and don't over schedule. The worst is going back to school exhausted because the summer has not allowed for any down time. Use it as a time to bond and rejuvenate and relax. Everyday doesn't have to have a major field trip or play date. It can if you want, of course, but consider a little more down time. More legos on the floor and less time racing around town from one museum to another. A good rule of thumb might be one "big" activity or adventure each week. Then let the other 6 days of the week "just be." It will be amazing to see what your kids come up with. Summer is a magical time of year and looks different for every family. By setting some goals, sticking to a routine, and not over scheduling our families, it can be even better. What are your goals for summer break? This post first appeared on TheIdeaRoom.net where you can find me guest posting twice a month.